YourCADservice provide different types of surveys for different sites, including new build, redevelopments, refurbishments, boundaries, underground service tracing and ground modelling for area and volumetric calculations. Reflectorless measurement capability means that information adjacent to your site can be included on your site survey, without the need for direct access. Surveys are undertaken using the latest Total Station Theodolites, all data is electronically measured and coded in the field, which is then downloaded directly to desktop PC's. The data is then converted into a high quality presentable format. Completed site surveys can be overlaid onto relevant digital mapping to give even greater information on a particular site. 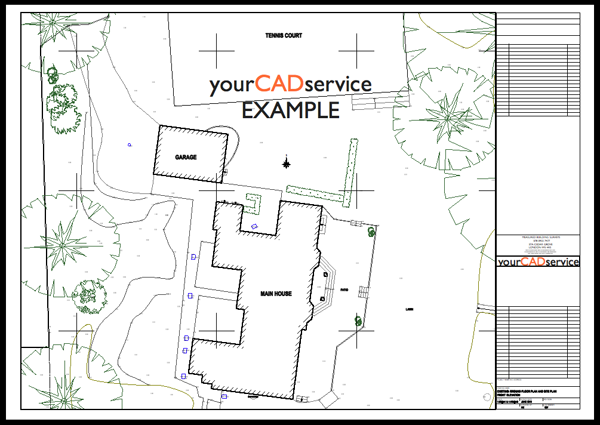 All YourCADservice survey drawings are produced in CAD and can be plotted on plain paper and stable film. Completed CAD drawings can be exported to a variety of other formats to suit individual needs. Drawings can be emailed directly to the client or any other consultant.